How high is it? This is probably the question most often asked about Niagara Falls. It would seem to be an easy answer, but the answer today depends on when you are visiting the Falls. In the early 1900s large quantities of water started being diverted from the Niagara River for the generation of electric power. This water does not pass over the Falls, but is channeled to the power plants 5 miles (8 km) downstream of the Falls. The lower volume of water passing over the Falls caused the level of the Maid of the Mist plunge pool to drop about 15 feet (4.6 m), thus increasing the drop (or height) of the Falls by 15 feet (4.6 m). Average flow over Niagara Falls with no power diversion --- 202,000 cubic feet per second (cfs) (5,720 cubic meters per second (m3/sec)) . April 1 to October 31 --- 100,000 cfs (2,832 m3/sec) during daylight hours, 50,000 cfs (1,416 cms) during the night. November 1 to March 31 --- 50,000 cfs (1,416 m3/sec) at all times. The remaining water is divided between Canada and the United States for the generation of electric power. The table below gives a comparison between the amount of water passing over Niagara Falls and the height of the American and Horseshoe Falls. This information is from a report by the American Falls International Board, made to the International Joint Commission in June of 1974. Niagara Falls is actually comprised of three separate waterfalls: the American Falls, the Bridal Veil Falls, and the Horseshoe Falls. The three falls are separated by two islands --- Goat Island and Luna Island. All height measurements in the following descriptions are given when the total volume passing over Niagara Falls is 100,000 cfs (2,832 m3/sec). Located on the New York side of the Gorge, between Prospect Point and Luna Island, the northwest facing American Falls has a straight line crest width of about 830 feet (253 m). If measured along the jagged lip of the falls, the crest is about 950 feet (290 m) long. The torrent of water passing over the crest of the falls is only about 2 feet (0.6 m) deep. About 10% of the Niagara River's volume flows over the American and Bridal Veil Falls. The river first falls vertically an average of 86 feet (26 m), before crashing on to an immense pile of talus boulders that lie at the base of the Falls. The shortest vertical drop, roughly 45 feet (14 m), is at Prospect Point. The longest vertical drop, roughly 117 feet (36 m), is about 250 feet (76 m) southwest of Prospect Point. The talus boulders, Lockport Dolostone, have fallen from the crest of the Falls, and are too massive to be eroded away by the force of the falling water. The water tumbles over and between this talus in a wild, violent, and thundering frenzy, dropping another 97 feet (30 m) to the Maid of the Mist Pool below. The total vertical drop of the American Falls is 183 feet (56 m), 10 feet (3 m) greater than the Horseshoe Falls. The average crest elevation of the American Falls is 510 feet (155 m). Located between Luna Island (97 feet (30 m) wide) and Goat Island (1,590 feet (485 m) wide) is the Bridal Veil Falls, the smallest of the three falls of Niagara. The Bridal Veil Falls faces to the northwest and has a crest that is 56 feet (17 m) wide. It is similar in appearance to the American Falls, starting with a vertical fall of 78 feet (24 m), followed by the water violently descending the talus to the Maid of the Mist Pool 103 feet (31 m) below. The total vertical drop of the Bridal Veil Falls is 181 feet (55 m). The crest elevation of the Falls is 508 feet (155 m). The Horseshoe Falls, sometimes called the Canadian Falls, is located between Terrapin Point on Goat Island in New York, and Table Rock House in Ontario. The border between Canada and the Unites States is located less than 100 feet (30 m) south of Terrapin Point, so about 98% of the falls is located in Canada. The Horseshoe Falls is 173 feet (53 m) high, has an average crest elevation of 500 feet (152 m), and faces northwards. This is the most impressive of the three Falls, with 90% of the volume of the Niagara River passing over it. It has a curving, horseshoe-shaped crest that is 2,200 feet (671 m) in length. At the center of the Horseshoe Falls the water is about 10 feet (3 m) deep. It passes over the crest at a speed of about 20 mph (32 kph). The first person to attempt to go over the Horseshoe Falls in a barrel was Mrs. Annie Edson Taylor, on October 24, 1901. She was 64 years old at the time, and survived the trip with only a few bumps and bruises. She had hoped the trip over the Falls would bring her fame and fortune. Unfortunately it did not, and she died penniless in the Niagara County, New York, poorhouse in 1924. As of 1997 eight men and two women have survived a trip over the Horseshoe Falls in a barrel. The most courageous and undaunted is Dave Munday, a diesel mechanic from Hamilton, Ontario. On his first attempt in July of 1985, the barrel became stranded in shallow water about a mile (1.6 km) above the Falls. In October of that year he made his first successful trip over the Horseshoe Falls. In October of 1987 he successfully ran the extremely violent Whirlpool Rapids in a steel barrel. In July of 1990 he attempted to go over the Horseshoe Falls again, but became stuck at the very brink of the Falls at Table Rock House. After his rescue Munday said: "The next time I go, I'll get over." In September of 1993 he kept his word, and at the age of 56, became the first person to survive a second trip over the Horseshoe Falls. 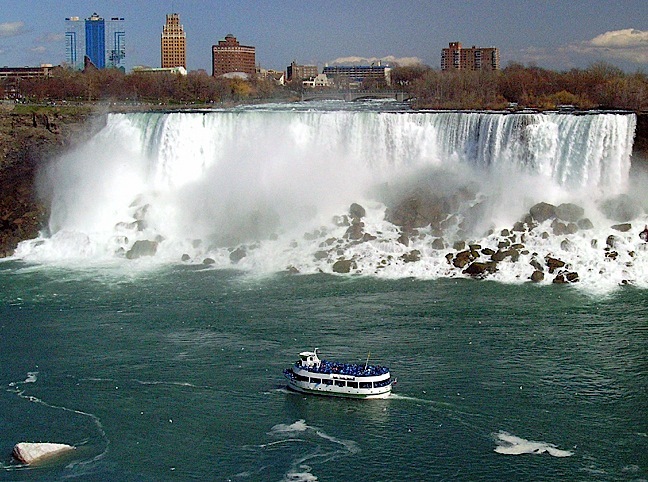 On July 9, 1960, a 7 year-old boy named Roger Woodward accidentally went over the Horseshoe Falls. The boat he was in had lost power and had turned over in the rapids above the Falls. Roger was only wearing a simple life-jacket, but he somehow survived the terror-filled plunge. Many people feel it was the hand of God that saved him. The diversion of water above Niagara Falls, which is used by the hydroelectric plants to generate electricity, has caused major changes in the appearance of Niagara Falls. Today half to three-quarters of the Niagara River's volume is diverted for use by the hydroelectric plants, with the remainder going over the Falls. Large scale diversion of water by the hydroelectric plants began in the early 1900s. With a lower volume of water passing over the Falls, the flanks of the Horseshoe Falls, at Terrapin Point and Table Rock House, were nearly dry, and the flow over the American Falls was greatly reduced. In 1953 a control dam was built about a mile (1.6 km) upstream of the Horseshoe Falls. The dam diverts more water over the American Falls and more evenly distributes the flow of water over the Horseshoe Falls. Also in 1953 work was undertaken to lower the river bed at both flanks of the Horseshoe Falls. Roughly 64,000 cubic yards (48,932 m3) of rock were excavated from the Table Rock flank, and 24,000 cubic yards (18,349 m3) from the Terrapin Point flank. The lowered flanks allowed more water to flow over them, resulting in a more uniform flow over the entire crest. Also a large area of the river bed, covering roughly 43,000 square feet, (3,870 m2) was built up about 10 feet (3 m) at the Terrapin Point flank of the Horseshoe Falls, creating the large viewing area. The Horseshoe Falls lost roughly 330 feet (101 m) of crest line because of this landfill. In 1955 a 200 foot (61 m) long, 30 foot (9.1 m) wide area of unstable rock was blasted off the southern flank of the American Falls. Its removal destroyed most of the overhang that created the Cave of The Winds, and also removed a 30 by 97 foot (9.1 by 30 m) viewing area at the west end of Luna Island. The most dramatic change in the appearance of the American Falls occurred in 1969. In June a cofferdam was completed from the east end of Goat Island to the American shore. The dam totally cut off the flow of water going over the American Falls, and diverted it over the Horseshoe Falls. For the next five months, until the removal of the dam in November, geologists and engineers studied the dry river bed from the dam to the crest of the American Falls, the rock formations at the now dry face of the American Falls, and the talus at its base. Large cracks in the river bed were filled in and several loose sections of rock near the crest of the American Falls were secured by large bolts. This study was undertaken to determine ways to preserve and enhance the beauty of the American Falls. After four years of studying the data obtained during the de-watering of the American Falls, several plans were proposed to preserve and enhance its beauty. The most ambitious plan was the removal of the talus pile at the base of the Falls, at an estimated cost of $10,000,000. After a year of deliberation, the decision was made to let Mother Nature take care of the Falls. It will be left alone, and allowed to erode naturally. In 1969 a large crack was discovered in the rock face at the Terrapin Point viewing area. Investigations revealed that the Point was unstable, and it was closed to the public. After waiting 14 years for Mother Nature to remove the unstable Point, it was decided to give her a hand, and blast the point off. On July 8, 1983, at 12:21 p.m., 8,600 pounds (3,870 kg) of dynamite were detonated at the Point. The blast removed 25,000 tons (22,500 tonnes) of unstable rock, and finally allowed the viewing area to reopen in September of that year.